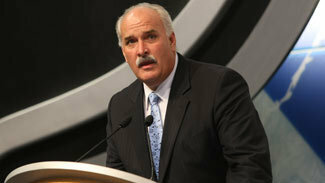 The Columbus Blue Jackets on Wednesday hired John Davidson as president of hockey operations. In the newly created role, Davidson will oversee all hockey operations, including general manager Scott Howson, and serve as an alternate governor. According to a team-issued release, Davidson signed a multiyear contract with the club. Mike Priest, who had been president of the team, will focus on the business side of the organization. "This is a very happy day for our family," Davidson said during a press conference at Nationwide Arena. "I've been very impressed by what I've seen here from the organization to the facilities, the city, and an ownership and management group that is committed to building a winner. As we looked at everything it became very clear that this was a perfect fit for us and we are proud to be Columbus Blue Jackets." Davidson, who was a goalie for 10 seasons in the NHL before embarking on a Hall of Fame broadcasting career, had served as president of hockey operations for the St. Louis Blues since 2006. He left the organization earlier this month after negotiating a buyout with new owner Tom Stillman. In Davidson's time with the Blues, the team went from having the fewest points in the League in 2005-06 to winning the Central Division last season while finishing second in the Western Conference and winning the franchise's first Stanley Cup Playoff series since 2002. The team Davidson inherits in Columbus isn't much different than the one he started with in St. Louis. The Blue Jackets, who have been to the postseason once in their existence, had the fewest points in the League last season. "J.D. changed the culture in St. Louis," Keith Tkachuk, a forward with the Blues from 2000-10, told The Columbus Dispatch. "I don't want to say he did it immediately, because he's a patient guy. He does it the right way. But he makes everybody accountable on and off the ice, especially in the way you carry yourself. From the top to the bottom of the organization, there's a standard that has to be met. "The Blues' organization, top to bottom, is one of the healthiest in the League now because of what he brought in. There's no reason he can't do that in Columbus." Davidson had been linked to the Blue Jackets since May, when a window in his contract with the Blues allowed him to meet with other teams. According to the Dispatch report, just two weeks ago, after his contract buyout with the Blues was completed, Davidson and his wife returned to Columbus to meet with owner John P. McConnell and others in the front office, and take a tour of the area. "This is a very exciting day for the Columbus Blue Jackets and our fans as John Davidson is a proven winner who brings a tremendous amount of experience, knowledge and leadership to our organization," McConnell said. "We believe he is the perfect person to lead our hockey operations efforts."